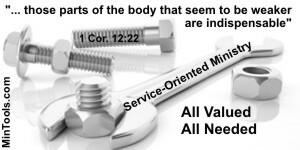 Some serve behind-the-scenes in ways that tend to hold the Body together so we’re calling these service-oriented church ministries Nuts & Bolts Ministry. 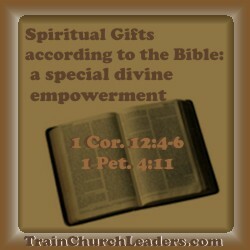 God empowers people for ministry by giving them spiritual gifts. While personality can also affect how the work is done, spiritual gifts are special divine empowerments, not natural talents or inclinations. In serving, however, no matter what we do, we should put all of who we are into all of who God is and let Him use us to His glory. The following spiritual gifts empower people to do clerical, communications, facilities and grounds maintenance, hospitality, staff support, technical services, and other service-oriented types of ministry. We’re calling these Nuts & Bolts Ministries because of how they tend to hold church life together. People with the spiritual gift of helps come alongside of others in ministry to provide relief from certain tasks that frees them up to do other responsibilities. As a result, the other person’s ministry is enhanced. Someone with the spiritual gift of hospitality serves people, even strangers, in ways that are warm and welcoming. As a result, people feel comfortable and like they belong. People with the spiritual gift of service tend to notice tasks that need to be done and do what they can, however simple or menial. As a result, undone tasks are seen through to completion. The following gift might also be used when organizing, coordination, and planning are needed and not simply doing a task. People with the spiritual gift of administration provide the guidance needed to accomplish tasks. They might do some of the tasks themselves but might also delegate responsibilities to others. As a result, these ministries are done in an efficient manner, most effectively using available resources. View these kinds of services as ministry. Value those who do these kinds of ministries. Recruit so appropriately gifted people are in these kinds of nuts and bolts ministries. The Nuts and Bolts Ministry Manual contains the content in this post and also looks at how different personality traits fit into the mix of who can or should serve in these types of ministries. According to Ephesians 4:16, everybody has a part in contributing to God’s work through the Church. And, all parts should be valued according to 1 Corinthians 12, not just those with more visible, upfront types of ministries like teachers or leaders. It also includes the more behind-the-scenes, less visible ministries such as clerical, communications, facilities and grounds maintenance, hospitality, staff support, technical services, and other service-oriented types of ministry. If we look at verses in 1 Corinthians 12 we see the value of all ministries based on God’s intent. God knows what He is doing. He designed each one of us to serve where He deems important. If we were to be able to do a cross section of the church at large in terms of the distribution of spiritual gifts, we would undoubtedly find a large percentage of people with the spiritual gifts of helps and service, two of the primary gifts used in these kinds of ministries. Yet, we tend to put more emphasis, or even more value, on those with the gifts of pastor, teaching, leadership, evangelism, or missionary. God, however, knew that the behind-the-scenes types of ministry would be important to holding church life together and that it would take many people to do it. Because of how they tend to hold things together, we’ll call their serving Nuts & Bolts Ministry. God puts great value on the nuts and bolts kinds of ministries. According to Thayers Lexicon, the Greek word used for “indispensable” in the above verse signifies that which is necessary, what one cannot do without. Though we might put more emphasis on the upfront leadership and teaching gifts, God does not. In a very real sense, people involved in what we are calling the nuts and bolts ministries, are like the hands and feet of the church. God is the One who has made these kinds of ministries honorable. If God considers people doing these types of ministries valuable, who are we to place less value on them? Rather, we should be protecting and affirming people doing nuts and bolts kinds of ministries. We must guard against elevating certain ministries as more noble. The Nuts & Bolts Ministry Manual includes the above content plus implications of it for those serving in these ways, for pastors and leaders overseeing them, and for the Body at large. It also contains a page for each of the six broad categories of ministries, listed in the second paragraph above, discussing the value of it for the Church and implications for those serving in that way, for those overseeing them, and for members of the Body benefiting from their service. Just a Church Secretary? Ouch! In the U.S. we have a holiday, Administrative Professionals Day, in which we try to let those who do clerical type of work know that they are appreciated. One day, however, will not stress the importance of those in the church who serve in this capacity. Pastors and other ministry leaders need to treat the church secretary, or administrative assistant, as vital every day because they truly are important to the work of God through His Church. Let’s not get the attitude that they are “just a church secretary” and contribute to feelings of inferiority. After all, they aren’t the pastor or ministry leader, one might think. They don’t have an upfront ministry but merely do behind the scenes work, one might reason. People who do clerical work often have the spiritual gift of helps and/or service both of which typically are used in behind-the-scenes ministry. To think this makes them less needed? Ouch! People who do clerical work often are not upfront leaders. They might hold what could be considered a “lesser” position than a church pastor or ministry leader. To think that makes them less important? Ouch! Church secretaries, administrative assistants — anyone doing clerical type of work or assisting church leadership, tend to keep leaders on track, coordinate so much of the ministry in the church, and serve as the first contact of people who call in or stop by the church for help. Many pastors would feel lost without this servant. Often this person makes leaders look better than they really are and rarely get the credit. Many ministries would be disorganized and floundering without this help. Often people do not stop to think about why things run so efficiently. Many people would not have a good first impression if someone wasn’t there to warmly greet and connect them to the help they need. Often we don’t think of how important that is to outsiders. Are you in this role saying you are “just a Church Secretary”? No way! You are needed, important … indispensable! You might not be told that enough but if faithfully serving, what God thinks of you is what truly matters! Are you a pastor or ministry leader benefiting from their services with the attitude that they are “just a church secretary”? If so, you need an attitude adjustment! Revisit 1 Corinthians 12 to see this person through God’s eyes and then start showing them more respect, appreciation, and affirmation. Are you a church member who rarely thinks about how vital behind-the-scenes workers are in God’s work? Maybe it is time to send them a thank you note or better yet express your gratitude in tangible ways now and throughout the year.